Are your antennas up to the test? Like with most products, an antenna’s outstanding performance in the field must be preceded by outstanding performance in the lab. 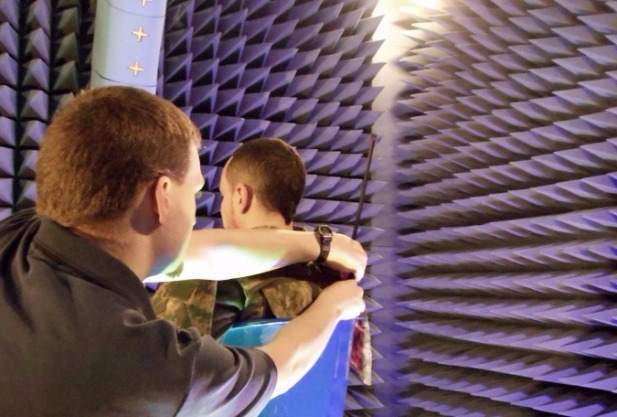 It is JEM Engineering’s job to not only design and manufacture antenna products, but also to qualify them to meet RF specifications, as well as environmental standards such as military standard MIL-STD-810 and RTCA/DO-160. Because of this, not only do our products survive strenuous environmental conditions; they perform well. We extend the same guarantee to our customers by offering them the same qualification services. Our rigorous qualification procedures combine our own internal testing capabilities with those of our external testing partners. In this post, we list some of our in-house qualification capabilities. The radiation efficiency, or simply “efficiency” of an antenna is commonly defined as the ratio of the power radiated from the antenna, in relation to the power delivered to the antenna. JEM’s Spherical Near-field Chamber (SNF) and Tapered Antenna Test Facility (TATF) chambers generate efficiency plots, in addition to as addition to radiation patterns, and ASCII Data Files. Directivity is one on of an antenna’s key performance factors. One can define it as the ability of an antenna to focus energy in a particular direction when transmitting. Directivity also measures the antenna’s ability to receive energy better from a particular direction. Another useful performance measurement is the antenna’s gain. It combines the antenna’s efficiency with its directivity. The gain measurements we provide as part of our data package include peak, average, maximum linear, minimum linear, horizontal, and vertical, as applicable. Additionally, SNF and TATF chambers generate gain measurements for antennas within two different frequency ranges. The SNF measures from 400 MHz to 6 GHz , while the TATF measures 80 MHz to 40 GHz. Voltage standing wave ratio, or “VSWR,” is a measure that describes how well the antenna impedance -or voltage to the current at the antenna’s input- “matches” to the radio or transmission line it is connected to. A good match allows a transmitter or receiver to deliver power to an antenna without excessive reflection back on the line (return loss). At JEM, a single VSWR measurment, including system calibration, takes less than 10 minutes. In fact, minus calibration, it only takes 1 minute or less to complete a test! An antenna’s radiation pattern measures the strength of its radio waves in relation to the direction at which the waves travel. We can generate both 3-Dimensional, as well as 2-Dimensional renderings of radiation patterns. Besides producing full-spherical radiation patterns, our SNF chamber can accommodate a human test subject. This allows us to take accurate measurements of body interaction effects on body worn and handheld devices. Temperature testing allows us to determine how a complete product, its parts, and its sub-assemblies are affected by extreme temperatures, as well as changes in temperatures. Consequently, this also allows us to assist customers in analyzing the cost effectiveness of manufacturing a product and using its components. Our team of experts has access to advanced simulation software, therefore, allowing us to measure in-situ performance, and eliminating need to run a physical test.